The summer is a great time for you and your family to play and exercise outdoors with your dog. However, dogs do not thermoregulate as well as humans. Therefore, to reduce the possibility of heat exhaustion or potentially life threatening heat stroke (hyperthermia), you will need to monitor your dog when playing or exercising outdoors on hot days. Thermoregulation is an animal’s ability to maintain its internal body temperature within a safe homeostatic range, despite disparities between the animal’s internal body temperature and the temperature of the ambient environment. Hyperthermia is defined as an internal body temperature greatly above normal or outside a normal range that occurs due to failed thermoregulation. From the standpoint of preventing hyperthermia, there are several factors that can interfere with a human or dog’s ability to thermoregulate, including high environmental air temperature, high humidity, intense or prolonged physical activity, dehydration, lack of heat acclimation, poor physical conditioning, and poor temporary or chronic health. When the preceding conditions substantially affect a human or dog’s ability to thermoregulate, the internal body temperature may rise to unsafe and even lethal levels. Since humans thermoregulate more efficiently than do dogs, a dog owner that feels comfortable during outdoor activity may become surprised that his/her dog exhibits the symptoms of heat exhaustion or potentially life threatening heat stroke. Worse yet, an owner that is unfamiliar with the symptoms of canine hyperthermia may allow the condition to fester before seeking veterinary attention, which may result in permanent disability or the death of the pet. To best understand why canine hyperthermia may appear suddenly, even when a human remains comfortable, we will start by examining human thermoregulatory physiology. The second part of the article will examine canine thermoregulatory mechanisms and contrast the efficiency to that of humans. The third part of the article will educate readers how to recognize the symptoms of canine heat exhaustion and heat stroke, how to immediately treat the symptoms, and how to exercise safely with your pet while preventing the likelihood of hyperthermia. The metabolic activity that occurs during periods of rigorous exercise creates an increase in body temperature. In addition, when the ambient temperature is warmer than a person’s skin temperature, a person gains heat via conduction and radiation. Since an abnormally high body temperature (hyperthermia) poses an immediate medical emergency, the human body attempts to maintain homeostasis by cooling itself principally via evaporation and secondarily via vasodilation. Evaporation occurs primarily via perspiration released from eccrine sweat glands located throughout the integument (skin), with a higher density of eccrine glands situated in the palms of the hands and soles of the feet. Eccrine glands release an odorless liquid comprised principally of water and salt (NaCL) and to a lesser concentration potassium, bicarbonate, glucose, and a variety of enzymes, proteins, and amino acids. The water then evaporates (converts from a liquid to a vaporous state) to create cooling, while some of the salt is reabsorbed through the skin. Humans also have a second type of sweat gland called apocrine glands. Apocrine glands are located only in specific areas of the body, with the highest density situated in the armpits, perianal area, groin, and areola. Apocrine glands secrete a more viscous sweat comprised of water, sebum, proteins, lipids, steroids, carbohydrates, and salt that is less effective at providing a cooling function. Apocrine sweat often appears in response to an extreme emotional state. Apocrine sweat starts as an odorless liquid. However, apocrine sweat attracts microbes that digest the sweat. The microbial digestive process creates fatty acids that produce an unpleasant odor, especially if the area has an abundance of hair. When the body temperature rises above a normal level the hypothalamus triggers thermoregulatory activity, including evaporative sweating and vasodilation. Thermoregulatory arteriolar vasodilation expands arteriole and capillary diameters so that an increased volume of blood convectively reaches the surface of the skin, whereby excess heat is radiated to the air, provided the air temperature is cooler than the body temperature. The human physiology for cooling is very efficient, although hot temperatures, humid environments, radiant heat absorbent clothes, and water impermeable clothing can impede the effectiveness. Unfortunately, the domestic dog’s thermoregulatory physiology is comparatively less efficient. Whereas humans have efficient eccrine glands throughout their bodies and oily apocrine glands only in localized areas, the dog has the reverse. Dogs have eccrine sweat glands only in the pads of their feet and in their nostrils. However, they have apocrine glands throughout their body beneath each hair follicle. The canine apocrine glands function primarily to produce oil that helps maintain the quality of the coat as an insulator. Since evaporative eccrine sweat glands constitute only a small percentage of the overall surface area of the dog’s body, sweating is a much less effective method for losing body heat in a dog than it is in a human. In addition, since the dog’s hair coat functions as an insulator, vasodilation is only effective in the few areas of the canine body not covered by hair, such as the tongue and ears. 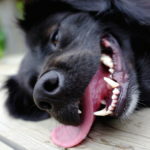 Therefore, dogs use panting as the primary method for thermoregulatory heat loss when the temperature is hot. Panting consists of inhalation and exhalation through the nose and mouth that exposes and extends the tongue, which enhances vasodilation, and that increases moisture and evaporation about the tongue, mouth, and nostrils. During extensive exercise in hot weather conditions, an increased heart rate and respiratory rate will occur that will increase the amount of panting and resultant heat loss. High air temperatures can cause extreme and/or prolonged panting, which in turn foments dehydration that impedes the further effectiveness of the panting process. Likewise, dehydration that occurs from insufficient water intake prior to exercise can impede the panting process. Similarly, high humidity can impede the efficiency of evaporation, which in turn impedes the effectiveness of panting in cooling a dog’s body temperature. In addition, the panting process is less efficient in a brachycephalic breed, such as a Bulldog, Pug, or Boston Terrier, that has a smaller mucosal and pharyngeal area to dissipate heat, which is why brachycephalic breeds are most susceptible to heat stroke. Lack of temperature acclimitization, obesity, age (very young or old), disease, and a dark hair coat are other factors that can predispose a dog to hyperthermia. Heat exhaustion is a precursor to heat stroke. Heat exhaustion occurs when the initial heat-related symptoms appear, but the animal’s body can still successfully thermoregulate. Yet, if measures are not taken to cease activity or to commence treatment, heat exhaustion can quickly progress to heat stroke. Hyperthermia occurs when an animal’s body temperature moves significantly above normal. Thus, hyperthermia occurs when physiological or environmental factors inhibit the effectiveness of thermoregulation. Hyperthermia/heat stroke is a VERY serious condition. 15. Elevated rectal temperature- above 104°. If you observe any of the above symptoms, stop exercising your dog and commence treatment immediately. Untreated, prolonged hyperthermia can result in seizures, renal failure, cardiac arrest, unconsciousness (syncope), shock, and death. 7. Taking your dog promptly to a veterinarian if one is nearby, especially if you can not stabilize your dog quickly or you did not identify the condition immediately. Regardless, you should take your dog to a veterinarian so that the vet can examine him/her for potential complications and so that the vet can promptly treat such complications should they be present. Occasionally, complications and/or permanent disabilities can occur subsequent to a period of heat stroke, even if a dog appears to have returned to a normal emotional state and a normal body temperature. Educated dog owners know how to identify the signs of heat stroke and know how to commence emergency treatment and stabilization. Nevertheless, prevention is the best treatment. 12. Do not leave your dog in a hot vehicle, even if the windows are lowered, temperatures can quickly increase to life threatening levels. In addition, do not exercise your dog until at least 2 hours after eating and do not feed your dog until at least one hour after exercise. The preceding reduces the probability of gastric dilitation volvulus, also known as stomach torsion or bloat, which is a deadly condition that can occur when heavy respiration, food, and liquids mix in the canine stomach. Although the summer months pose additional risk you do not need to eliminate all exercise. Rather, implement the precautions listed above and monitor your dog for signs of heat exhaustion. If you diligently adhere to preventive protocols and observe your dog for clinical signs, you should experience safe and happy exercise with only a negligible risk of hyperthermia. © Mark Spivak and Comprehensive Pet Therapy, Inc., July 2014. All rights reserved.